Plans for a third runway at London's Heathrow Airport have been scrapped by the new government. Councils, residents and green groups had opposed the expansion scheme which Gordon Brown said was needed for economic reasons. John Stewart, from Hacan ClearSkies, which campaigned against the runway said he was "absolutely delighted". Airport operator BAA said it would work with the new government to provide strong trading connections. The decision to cancel the plans came in a joint Conservative-Liberal Democrat policy agreement. That unlikely alliance of campaigners - the councils, the residents and environmentalists - have won. 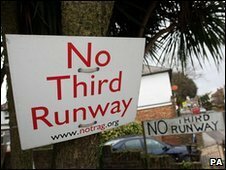 It was always common ground between the Conservatives and the Liberal Democrats to oppose the third runway. A campaigner I've met many times over the years said she could not stop crying when she heard the news this afternoon. There will be parties tonight in Sipson, which was due to be demolished under the plans. But there is caution from campaigners because of previous "broken promises". The new government said it would also refuse any additional runways at Gatwick and Stansted airports. BAA, supported by airlines and commerce in the capital, had argued that Heathrow needed extra capacity and without it London - and consequently the UK - would lose out to rival European cities as a place to visit and do business. Such a runway was envisaged in the government's 2003 aviation White Paper and the green light was given by the then Transport Secretary Geoff Hoon in January 2009 despite the fact that the village of Sipson would effectively have disappeared during the construction project. The Tories opposed the plan, preferring improved rail links to and from Heathrow including a direct link to a new London to Scotland high-speed rail line. In a statement on Wednesday BAA said: "We will work with the new government to ensure that airport policy provides the strong international trading connections on which the UK's jobs and future competitiveness depend." Mr Stewart said: "The third runway is dead in the water. Residents under the flight path are delighted and people who stood to lose their homes are relieved. "It is also good for London as a whole as it would have been bad for the environment and it was not essential for the city's economic well-being. I'm absolutely delighted." But Dr Adam Marshall, from the British Chambers of Commerce, said this decision would diminish London and the South East's "attractiveness to investors with potential consequences for the UK economy as a whole". Ben Stewart, from environment group Greenpeace, added: "A third runway at Heathrow was always a bizarre proposal that made no sense to anybody who understood the impact aviation has on our climate. "Corks will be popping for a few days after this announcement, though probably not at BAA headquarters." Geraldine Nicholson, chairman of the No Third Runway Action Group, said: "Our task now is to regenerate Sipson and the other villages which have lived with so much uncertainty in recent years." Actor Richard Briers said he would be going to 10 Downing Street on Thursday to thank David Cameron and Nick Clegg and present them with a legal Deed of Trust containing the names of more than 90,000 people who jointly own a plot of land at the centre of the proposed runway development.